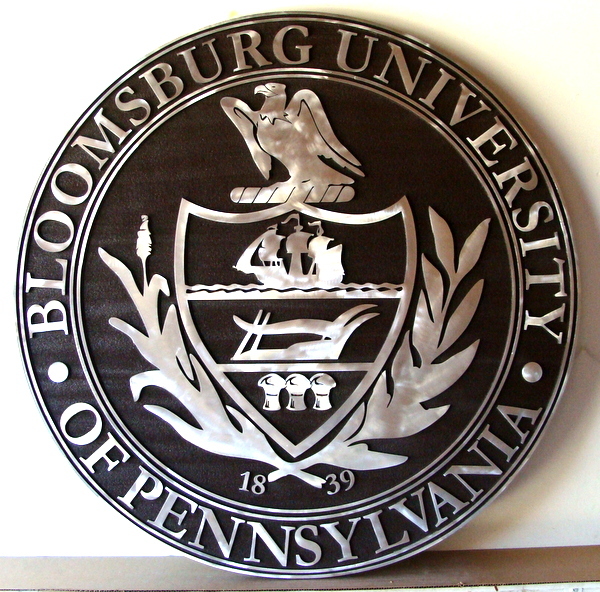 Above is shown an aluminum-clad 2.5D flat relief carved Western Red Cedar wall plaque, with the seal of Bloomsberg University. The plaque is carved in 2.5D with raised flat letters and art from Cedar and stained, and then very thin aluminum text and art is cut from a sheet with our computerized router and epoxied to the the wood. This plaque is 30 inches in diameter. To see prices or get Estimate and Order forms , click on gray boxes in upper left margin. Click on dark gray tabs on the header to see Home and other informational pages. Click on one of the light gray numbered boxes in the lower left margin to see other photo galleries.Other college and school plaques are shown in Gallery 34.